The Knight is a tank class, starting with the highest vitality value of all classes, as well as the most robust equipment. This does mean that Knights move slowly, so fight carefully and expect to take some hits, or alternatively unequip some gear for a lower Equip Load. Most weapons are easily equippable for a Knight, and their Faith stat is only one point short of being able to cast the Heal Miracle. An early Strength increase is recommended in order to focus on killing enemies in as few attacks as possible. 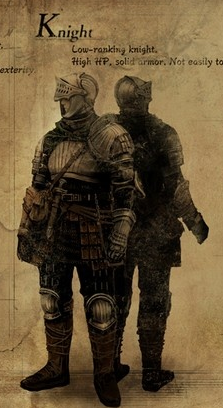 The Knight starts as a member of the Way of White covenant.